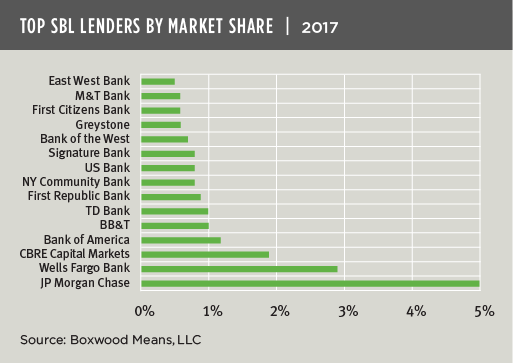 It wasn’t long ago that commercial banks dominated CRE lending in the small-balance market. That supremacy is facing increasing challenges from a plethora of non-bank lenders including debt funds, marketplace lenders, private lenders, specialty finance firms and selected life insurance companies among others. The maturing credit cycle has already proven to be a brake on some CRE lending among commercial banks as they recalibrate their appetite for riskier small-balance loans under $5 million that may involve, e.g., transitional properties, new construction, high leverage and/or DSCRs, and non-MSA locations, among other factors. The tremendously popular and successful multifamily small-balance lending programs from Freddie Mac and Fannie Mae have also substantially re-shaped the competitive scene of late. But while depositories can typically maintain an edge for solid CRE credits with better loan pricing, their ultimate and long-term threat lies in the speed and efficiencies to close loans that some non-banks have achieved with liberal use of technology. And so while historically commercial banks held all 15 of the top spots in the league table and commanded a national market share percentage in the mid-twenties, that has now changed: Boxwood’s research indicates that commercial banks’ overall market share narrowed to 19% last year; and, conspicuously as the nearby graph shows, two non-banks cracked the lineup as both CBRE Capital Markets (#3) and Greystone (#12) benefited from their prodigious Agency lending programs. New waves of capital have proven advantageous to traditionally underserved small property owners, investors and Main Street businesses. Total 2017 volume of nearly $230 billion in SBL originations was massive and, from a casual distance, the space may look like wide open and placid terrain. Yet to a better trained eye, the SBL landscape is now a dynamic and shifting frontier with nimble players challenging incumbent commercial banks like never before.